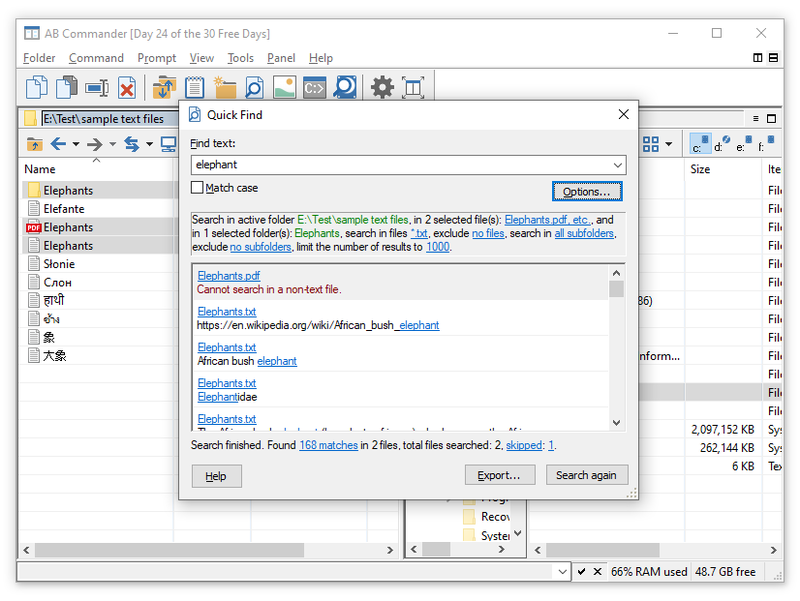 AB Commander comes with a built-in Quick Finder that you can use to quickly search for the text files that contain a particular text fragment. You can choose to search in the subfolders of the selected folder, or specify the types of files to search in and/or the types of files to exclude from the search. Quick Finder will analyze each such file, and display all lines of text found in such files for you to review. You can also save the search results in a text file, using the Export button on the Quick Find window. In addition to the built-in Quick Finder, you can also set up an external text searching application, such as the standard Windows Search command, for an alternative method of searching for text in files. You can change this assignment using the Tools page of the Options window of AB Commander.